Some of my one-of-a-kind, whimsical, collector dolls inhabit an imaginary world called Margo’s Place, a swinging night club populated by performers, patrons and paparazzi. Others belong to The Ladies Tea & Garden Club, a polite group of sippers and sowers who gather weekly at The Rose Cottage Tea Room. Earth Day monster children’s book “FRANKENSTINK! Garbage Gone Bad” is a read aloud, laugh aloud story for kids who don’t like to clean up their rooms. 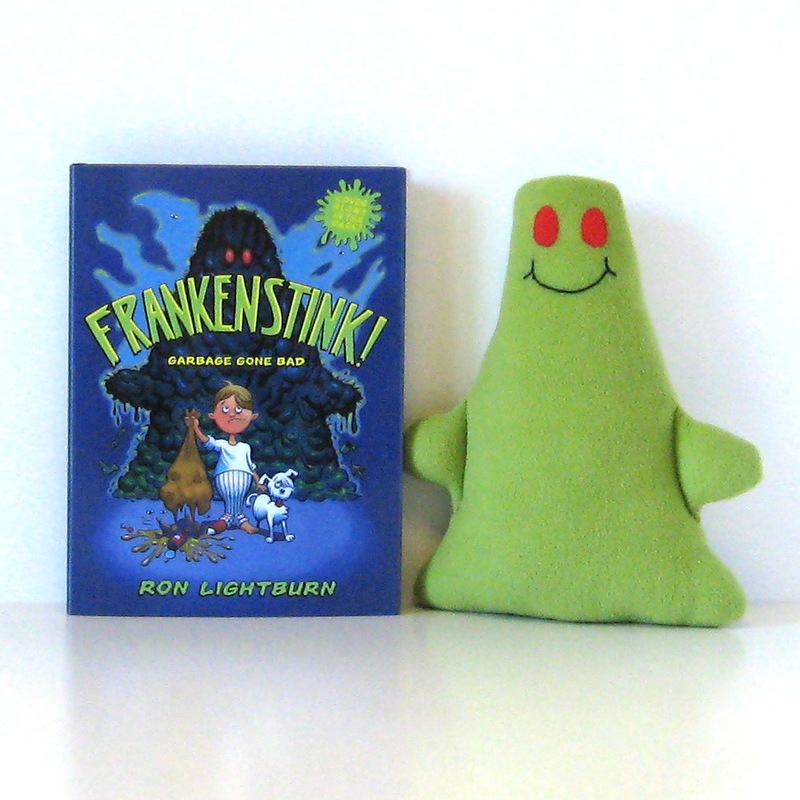 They’ll cuddle with their own plush Little Stinker while reading this funny monster under the bed tale. With a glow-in-the-dark cover and zany art, this is a book about “garbage” that transforms and mutates into a grotesque, greedy monster devouring everything in its path. Is the monster who feeds on “a mountainous salad of plastic and goo, fast-food leftovers and Styrofoam stew,” real, a dream, or a warning of what is to come if we don’t compost and recycle? The rhyming text is complemented by playful illustrations in a comic-book style. “FRANKENSTINK! Gabage Gone Bad” is written and illustrated by award-winning illustrator, Ron Lightburn. The book is autographed by Ron. If you would like your copy personalized, please contact me. Teachers and librarians highly recommend “FRANKENSTINK! Garbage Gone Bad” for reluctant readers. Jimmy Thing, has finally wrangled the rats at Margo’s Place Night Club! The club was infested with rats! “Now I have to hire a Rat Wrangler”, Margo groaned. “Who can I call?” Don’t worry, Margo. Unfortunately, while Jimmy was rat wrangling, there was a bit of unpleasantness in the kitchen. It took some fast talking to convince Jimmy that his services were not required regarding the rat he found in the kitchen wearing a chef’s hat. The guest celebrity chef, Ratatouille, was visibly upset when the ensuing uproar caused his signature souffle to deflate. Jimmy’s mother, Mrs. Thing, is very proud of her Jimmy and she thinks he looks very smart in the sweater and toque set she knit for him. 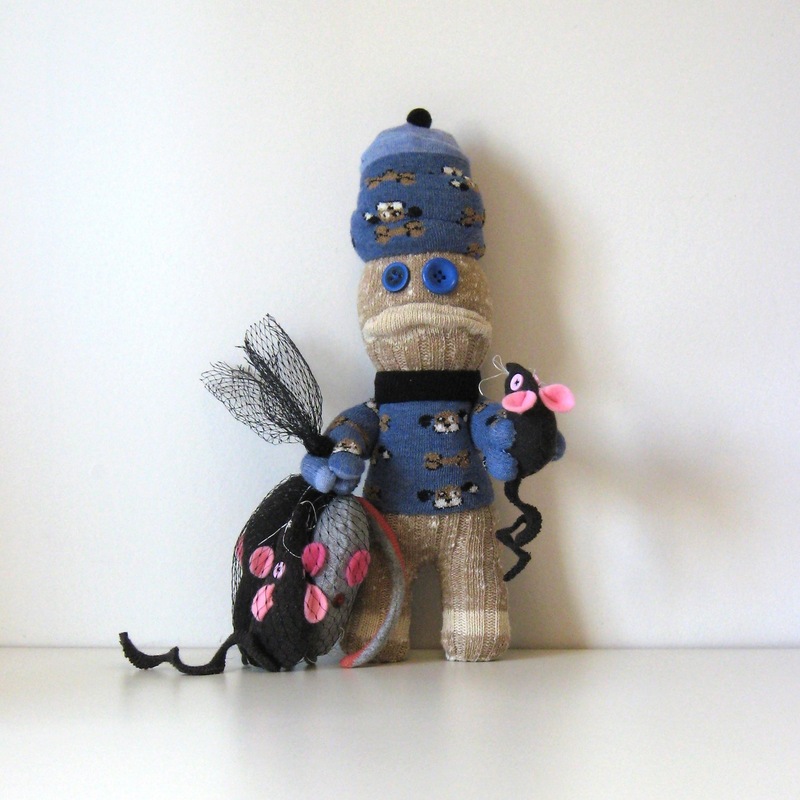 Jimmy Thing and his rats are made with new socks, new fiberfill, buttons, dental floss, felt and a plastic mesh bag. He measures 13 1/2 ” (34 cm) tall x 8″ (20 cm) wide. 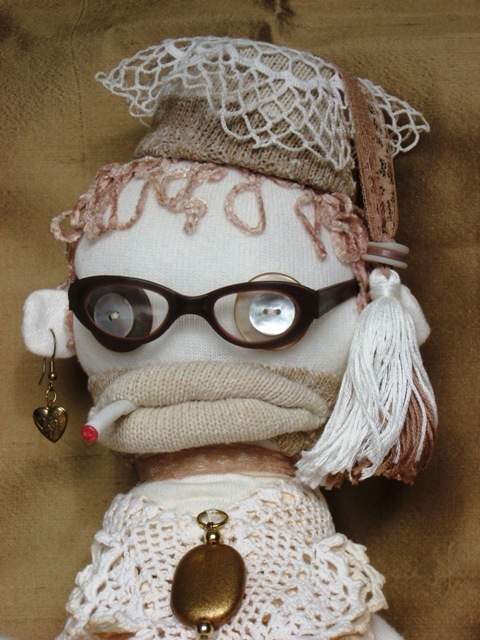 Blanche is made of socks, distressed doilies, buttons, embroidery thread, trim, doll glasses, yarn and found objects. Her doily skirt was crocheted by my grandmother in the early 1960’s. She measures 19″/48 cm tall and 8″/20 cm wide. “Nerve tonic” not included. Second Hand Rose is made of second hand fabric, new socks, new fiber fill, trim, buttons, glass bead “pearls”, chenille stems, hand spun fleece hair and found objects. She measures 14″/35.5 cm tall and 6″/15 cm wide. Second Hand Rose has poseable arms and legs (chenille stem “bones”). 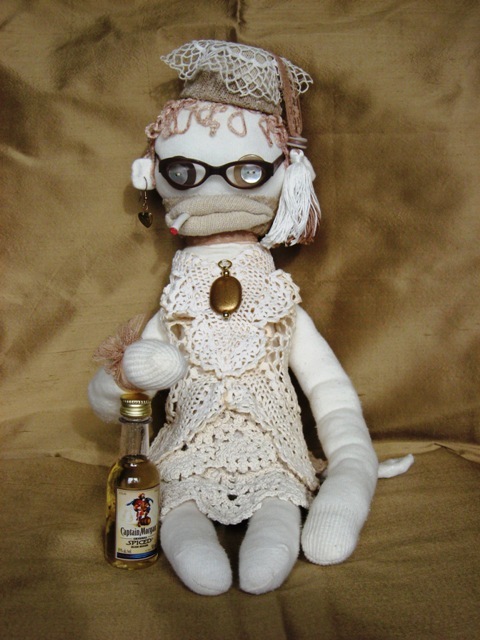 Mrs. Thing is made of new socks, new fiber fill, buttons, yarn, trim, wood and found objects. She measures 19 inches/49 cm tall and 17.5 inches/45cm sitting in her wicker chair. Mitzi is made of new socks, new fiber fill, yarn and buttons. She measures 15.5 inches/39 cm tall and has a poseable tail with chenille stem “bones”. The washtub is metal and the bubbles are made of painted Paperclay®. Lola is made of new socks, new fiber fill, yarn, buttons, beads and found objects. She measures 15.5 inches/39 cm tall. Estelle is made with new socks, vintage sock, new fiber fill, buttons, doll glasses, lace seam binding, silly pencil, new notebook, plastic lid (hat), pom-pom and chenille stems. She measures 14.25 inches/37 cm tall. Estelle has poseable arms and legs (chenille stem “bones”).